Scavenger Hunt Check-in #2 Winner! 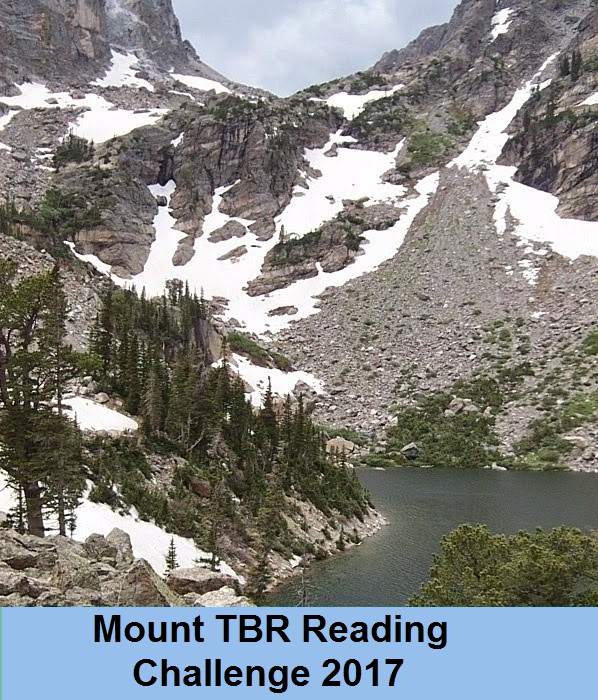 Mount TBR Checkpoint #2 Winner! 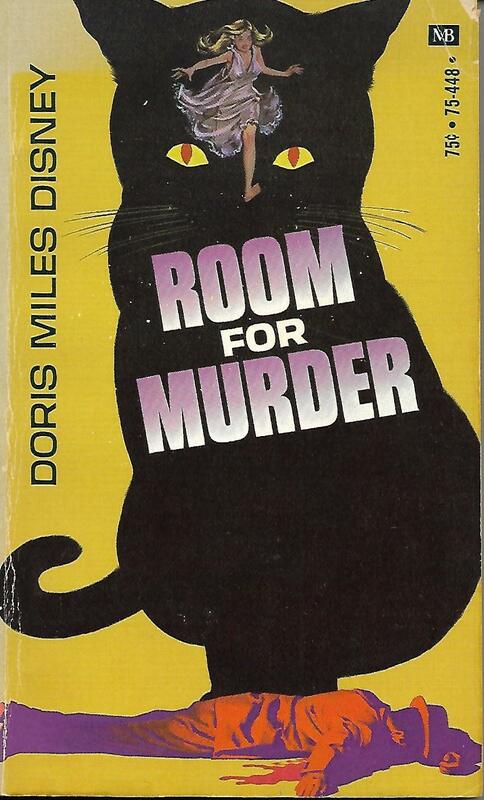 Judging from the cover of Room for Murder (1955) by Doris Miles Disney, it would seem that after going to the dogs I have now changed my allegiance to cats. Except that cats don't really have a whole lot to do with the story. Sure, Aggie Scanlon, one of our main characters, has taken on the nursing duties of three kittens when their mama doesn't want to be bothered with feeding them. And...she's even named them Wyken, Blyken, and Nod. And maybe they reflect her penchant for taking in the motherless and abandoned. But they have nothing to do with the death of Mr. Robert Lovejoy. 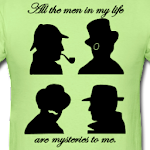 And they certainly don't have anything to do with solving the mystery. The Misses Kate and Aggie Scanlon are sisters of Irish extraction who run a rooming house at 1228 Drum Street in Somerset, Connecticut. They live there with several boarders as well as their niece, Teresa, who has lived with them since she was a toddler. She is now of marriageable age. The aunts despair of Teresa ever finding a suitable husband--for which read rich, well-established in a good job (doctor, lawyer, etc. ), and Catholic. Teresa has shown no interest in any of the prospects who have had the aunts' seal of approval thus far. Of the sisters, Kate is the level-headed one. She has charge of the house, does the cooking, and generally vets any prospective roomers. Aggie is more flighty, romantic, and apt to take in anybody who looks like they need a good home. Her one other vice (as these things are viewed by Kate) is reading true crime magazines. She was a maid in service before the sisters took on the rooming house and even now she does the maid's work--general cleaning and "doing up" the rooms. When Mr. Robert Lovejoy came looking for a room, he was very seedy looking and not all the type that Kate would have approved of. Fortunately for Mr. Lovejoy, Kate wasn't at home and Aggie had him installed in a room before Kate can object. Mr. Lovejoy isn't the ideal roomer. Oh, he's polite enough and causes no trouble while he's alive. But he has the air of the rolling stone about him, has no job--though he claims to be looking, and has the odor of alcohol about him more often than Kate believes necessary. He comes home one night having had one (or two) more than his limit, exchanges a few words with Aggie, and then later Aggie hears him drop his shoes on the floor and stumble into bed in the room above hers. Later that night, she is awakened by an unknown sound. She then hears odd, shuffling shoe-shod footsteps above her head. She wonders in her half-wakened state why Mr. Lovejoy would put his shoes back on to go to the bathroom and falls back to sleep. When morning comes, Mr. Lovejoy is discovered dead below his opened window. 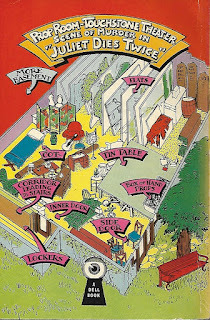 Chief of Detectives Zimmerman and Lieutenant Birdsall hear Aggie's story of Lovejoy's return home the night before, take one look at his bed, and decide that the man came home blind drunk, felt sick, stumbled to the window for air, and fell out. Sergeant Dennis Callahan and Aggie aren't convinced. Miss Aggie tries to impress upon the ranking officers the importance of the footsteps--she's just sure they weren't Mr. Lovejoy and both she and Dennis wonder why the man didn't cry out or grab the curtains to try and save himself. At first Dennis is just a little curious and uses the small irregularities as an excuse to return to the house and get better acquainted with Teresa (whom he has taken quite a shine to--to the aunts' dismay, after all he's just a policeman). 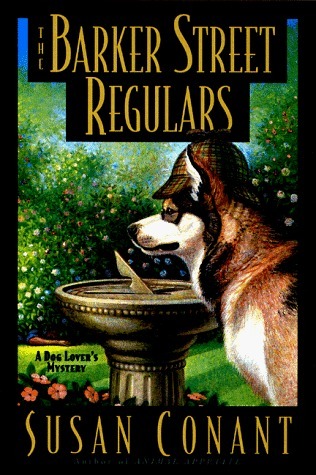 But with Aggie's dogged determination to play detective herself and her steadfast belief that Mr. Lovejoy was murdered forces Dennis to look more closely at everything and soon he's following up clues--from those mysterious footsteps to a newspaper article kept by the dead man to references to a barroom brawl that happened years ago and resulted in another man's death. Clues that lead him to a startling conclusion. This fulfills the "Damsel in Distress" category on the "Golden Vintage Scavenger Hunt card. The Barker Street Regulars (1998) is the eleventh book in Susan Conant's Dog Lover's Mysteries and my first taste of the series. Other than missing any background information on Holly Winter and her relationship with Steve Delaney, vet to her two Malamutes Rowdy & Kimi and her lover, I couldn't see that dropping into series in mid-stream was any problem. In this particular outing, Holly and Rowdy are working on his Rx.D. (therapy dog) certification by making visits to the Gateway Rehabilitation and Nursing Home Center. They become particularly close to Althea Battlefield, a formidable woman at the age of ninety, who is a devotee of Sherlock Holmes. Althea and her two equally elderly admirers, Hugh and Robert, spend many visits discussing obscure points in the Canon and quoting large chunks of the stories to one another. Holly begins rereading the stories just so she can keep up. 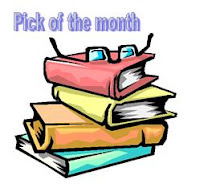 A very fluffy cozy mystery (no pun intended--well, maybe just a little bit) that is particularly well-suited to dog lovers as well as all those who enjoy animals in their mysteries. The Holmes connection was equal parts fun and annoying. I enjoyed the elderly trio of Holmes aficionados, especially the two gentlemen playing Holmes and trying to capture the killer with Holly's (and Rowdy's!) help. But a lot of the Holmes connections seemed very forced and contrived. Also, I realize that Holly was a bit distracted with her rescue of the cat, trying to incorporate said cat into her household where two Malamutes hold sway, and trying to figure out how to get Gloria & Scott (there's a Holmes connection for you) to stop bad-mouthing her veterinarian lover--but she really did fall down on the job when it came to identifying what had happened to the missing dog. You'd think someone as connected to dogs as she is would have gotten that right away. Juliet Dies Twice (1943) by Lange Lewis is my second theater-related mystery in row and my third novel by Lewis [having already read The Birthday Murder and Meat for Murder. 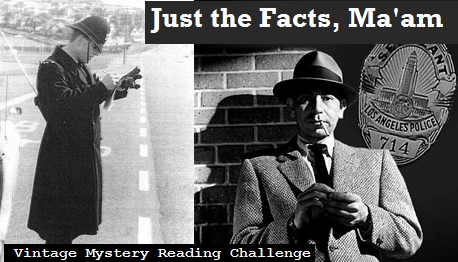 It is also set at a university in Southern California, which is an added bonus for this academic mystery fan. Eudora York is a psychology major at the university who also has an interest in the theater and serves as props mistress for the Drama Department. When her psychology professor sets up a demonstration to show "the efficiency of the association-test method in revealing the content of the subject's thought," Eudora and her good friend Millicent Legg are chosen as the subjects. Each is given an envelope with instructions to follow before coming back to the classroom for the test. Eudora is sent to the Drama Department's prop room where she finds Ann Laird, currently playing the lead in Romeo & Juliet, apparently made up with white face powder and feigning death. Another envelope tells Eudora that she is the murderess. She returns to the classroom determined not to given anything away with her answers. But after both she and Milly answer the word associations and the class is asked to write on slips of paper who they think saw a "dead body," Eudora receives the most votes. As she gathers her notebook in preparation to leave, Professor Brewer asks her for the key to the prop room. Feeling a little miffed that she gave herself away, she does so and retorts, "I hope you gave her a key, because I locked the door when I left." The professor is baffled--for you see, the "dead body" was supposed to be a male student. When he and Eudora investigate, they discover that they have a real dead body on their hands. Ann Laird has been killed by the proverbial blunt instrument. Brewer calls the police and informs the university's president. Lieutenant Tuck and his gloomy shadow Detective Froody are assigned to the case. Soon, they're making their way through rival actresses, ardent admirers, and--the obvious suspect--Ann's husband. But no one seems to have hated Ann enough to murder her. Eudora has a few thoughts of her own and when a mysterious threatening voice calls Jim Laird to say that he knows who killed Laird's wife and a notice for a funeral parlor is fastened to the play's notice board near Ann's picture Eudora becomes convinced that a lunatic is to blame. Lt. Tuck much prefers his murders to have good old fashioned motives. Which of them will be right? 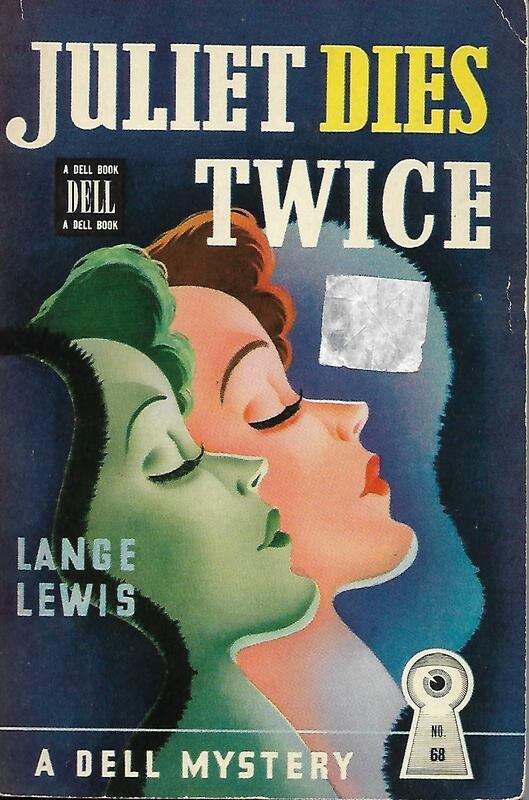 Another fairly entertaining novel by Lewis (Jane Lewis Brandt, 1915 - 2003). A light story which mixes a layman's knowledge of abnormal psychology with a conventionally-plotted mystery with a dash of romantic entanglements. The academic setting helped this one along for me. It's definitely pre-feminist, so don't be surprised at the rather trite summation of Ann's character at the very end. I enjoyed the mystery itself--but was definitely disappointed with the final scene of the book involving Eudora. After enduring the man who has been giving her fits throughout the novel--sending her a fish on ice at one point (to indicate that she was a "cold fish")--she winds up marrying him! Not my idea of a happy ending for Eudora. ★★★ and 1/2 stars. Fulfills the "Musical Instrument" category on the Golden Vintage Scavenger Hunt card. For another take on Lewis's novel, please visit John's review at Pretty Sinister Books. Thanks to the British Library Crime Classics series mysteries from the Golden Age that have been forgotten are finding a new readership. Mysteries like Quick Curtain (1934) by Alan Melville. As Martin Edwards mentions in his excellent introduction, Melville's book is a delightfully witty detective novel and Melville's "aim was to have fun with the genre." Dorothy L. Sayers took him to task in her review for not following police procedure, but, honestly--and I love Sayers's novel--Sayers doesn't stick that closely to procedure herself. Would Scotland Yard really let Lord Peter Wimsey go bargin' round hunting for clues as an amateur? Probably not. But it makes for lovely stories. As does Melville's use of Inspector Wilson of Scotland Yard and his journalist son (who plays both side-kick and devil's advocate to his father). They have a bantering relationship where each wants to prove to the other how smart they are and to reach the solution first. They make light of the other's ideas, but underneath it all is a bedrock of affection that keeps them together. 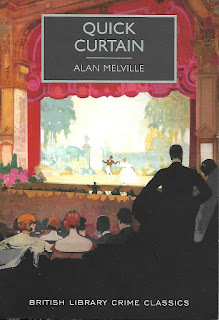 Melville also uses his experience in the theatre world to give us a murder set beyond the footlights of the London stage. Douglas B. Douglas is ready to accept the accolades that should follow the opening of his latest musical extravaganza, Blue Music. He is sure the newspapers will be filled with rave reviews of the performances of his stars Brandon Baker and Gwen Astle. What he doesn't expect is that Brandon Baker will feature in a news story of a very different sort--as the victim of an apparent murder-suicide. In the middle of Act 2, Baker's character is meant to be "shot" by his on-stage rival played by J. Hilary Foster. The gun is supposed to be empty (with the gunshot sound produced off-stage), but Baker falls dead from a very real bullet. Inspector Wilson and his son Derek are in the audience and Wilson takes command of the situation. Foster has disappeared and when the actor is traced to his dressing room he is found hanging by the neck. Wilson is prepared to call it murder followed by suicide in a fit of remorse, but there is no suicide note and there are a few other oddities as well--like the position of the bullet when it's dug out of the proscenium wall and the woman who shows up at the inquest and the funeral and who claims to have been Baker's wife. Pretty soon father and son are following a trail that will lead to a country inn and another dead body. They will both make several mistakes along the way to a final solution. 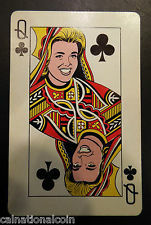 This fulfills the "Performer" category on the Golden Vintage Scavenger Hunt card. 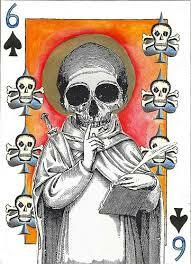 Week 27--I drew the Six of Hearts which gave me "The Dancing Detective" by Cornell Woolrich [from Murder by Experts by Ellery Queen, ed.] (a story I now remember reading some time in the past). In this, Ginger, a dance hall girl, loses her best friend when a killer makes a habit of killing girls from the dancing halls. 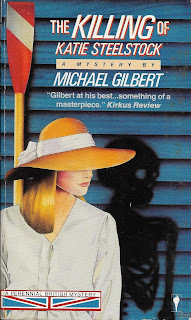 Nick, the policeman on the case, takes a fancy to Ginger and when the killer sets his sights on Ginger, she has to hope that Nick will get the messages and clues she's left behind--before she becomes another "Poor Butterfly" in the killer's collection. Week 28--I drew the Six of Spades which gave me "Written in Blood" by Chris Lawson [from The Year's Best Science Fiction 17th Annual Collection by Gardner Dozois, ed.] Written before 9/11, the story focuses on Muslims and the fear and resistance people of their faith face. A man discovers a way to write the Qur'an in the blood (DNA) of the faithful, but a believing man of science fears what use the secrets of that DNA might be put and makes his daughter (a budding young scientist herself) promise to find the key to the DNA...and a way to protect Muslims from their very faith being used to kill them. 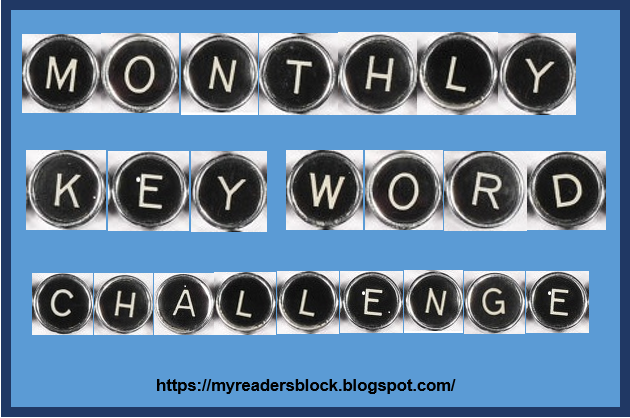 Week 29 [this week!] 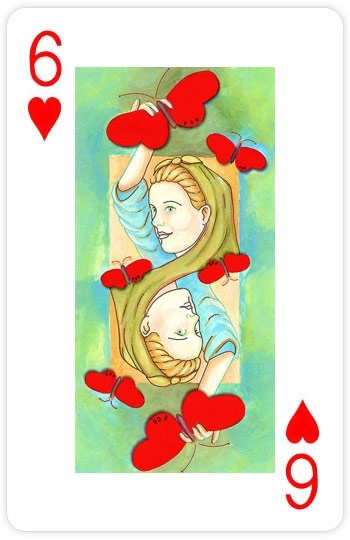 --I drew the Five of Diamonds which brings me to "The Sky-Green Blues" by Tanith Lee [from The Year's Best Science Fiction 17th Annual Collection by Gardner Dozois, ed.]. A strange story about Frances, a journalist on an alien world, who wants to complete an interview with an elderly writer before invaders destroy everything. She and the writer's servant escape the enemy invasion...only to learn that that the story Frances has been recording may be a different kind of story all together. The story begins in The Bygone Era, an antique shop in the village of Little Shendon. The proprietor, Bartholomew Fynche is waiting for someone. His thoughts reveal to us that he has made a discovery (we're not to be told yet what precise discovery) and that his visitor may not be at all pleased with the results of their little meeting. By the end of the first chapter, we know that this is true--because that someone (again, we're not told who) has bashed Mr. Fynche over the head with an Edwardian candlestick and left him quite dead. Fynche's cleaning lady comes into the room some time later and, given her shrieks, soon the whole village knows of the murder. 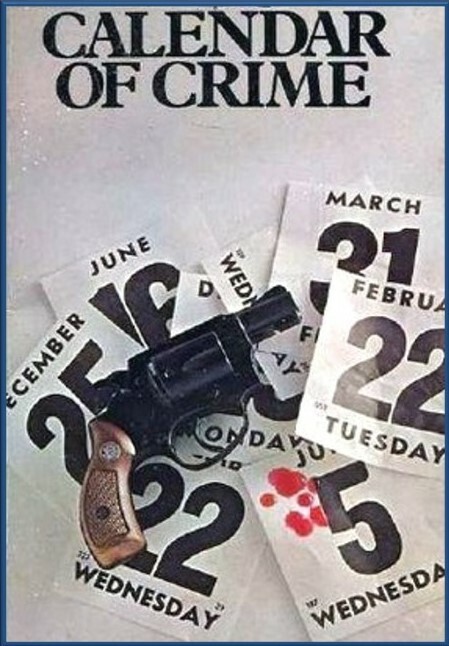 Inspector Burgess is quickly on the spot and once the doctor, after confirming the method and timing of the death, informs him that rumor has it that Fynche was once connected to MI5, Burgess decides to call in Scotland Yard. Superintendent Milner of the Yard suggests that it would be even better if Sir Victor Hazlitt, a former Intelligence man himself, were to lend a hand and Hazlitt in turn brings along his friend Beresford Brandon, a Shakespearean actor with more than a passing interest in matters of crime. The trio of detectives divide up the work and each takes on the task of interviewing various members of the village. It becomes apparent that nearly everyone in the village was seen in the shop or in the near vicinity around the time of the murder. And...Mr. Fynche was not precisely a well-loved character and just about everyone had a reason (from small to large) to be glad that the man is dead. Certain villagers seem to have more to hide than others--from the cook who works for Sir Victor's aunt and who seems very worried about something to the gardener who thinks where he was and what he was doing is nobody's business but his own to the young woman who arrived in the village a short time ago and who has an unknown connection to the murdered man to the maid's young beau who manages to lose his jacket in the wrong place at the wrong time. There are also clues to be followed up: a mysterious piece of paper with a "P" and an "O" (or part of an "O"), a squiggle that looks like an "S" or a snake, and something that looks like two sticks; Fynche's missing ring; and a priceless jade horse. Burgess, Hazlitt, and Brandon will have to sift through a great deal of chaff in their interviews before a few illuminating bits of information will put them on the right track. 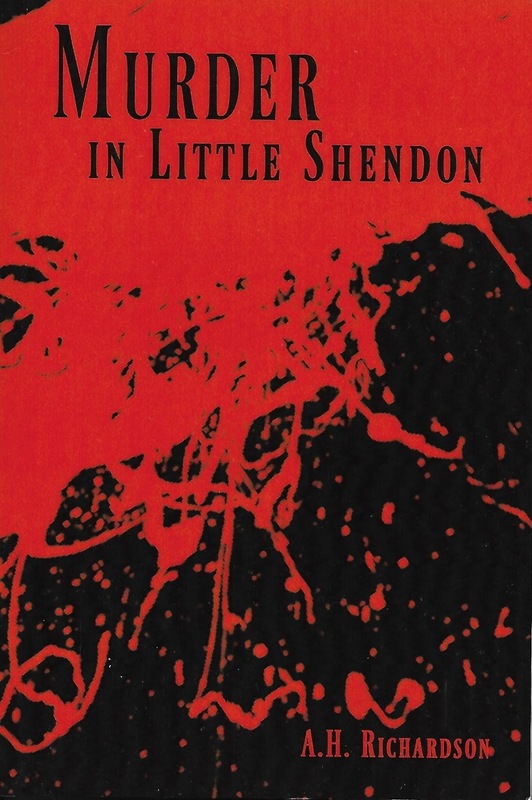 Murder in Little Shendon (2015) is a classic detective novel in the Golden Age tradition. The village setting in very reminiscent of Agatha Christie, particularly the Miss Marple stories, and the time period is close...some time after World War II. We have a fine mix of the more official detectives--Inspector Burgess of the local force and Sir Victor with his former ties to Intelligence--and the amateur crime solver Brandon. Before Brandon decided to trod the boards, he had given thought to a career as a police detective, so his interest is a bit more than that of the average amateur. The trio make a good team with each detective well-drawn and bringing different strengths to the investigation. Brandon is, as one might expect from an actor, very good at charming the witnesses and getting them to talk. The mystery plot is, in general, put together very well and so is the investigation. 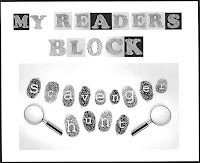 The solution is a little pat, but overall very satisfying and I enjoyed reading a recently published mystery that follows the classic crime tradition so nicely. I understand that Ms. Richardson has followed this novel with two more mysteries featuring Sir Victor and Brandon and I look forward to giving them a try. ★★★★ overall for the story itself. 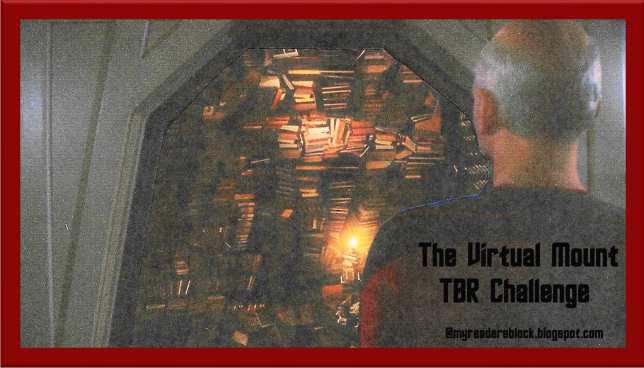 I have just a few quibbles with the novel--as a book. First--the formatting is annoyingly distracting. It is formatted with double-spacing between every paragraph. Absolutely unnecessary in a novel and it breaks up the page as well as the reading flow. It's as if it was decided ahead of time that we MUST have at least 248 pages using this particular font size and, by golly, if we've got to double-space to get there, then we will. Added to that, the paragraphs are, generally speaking, very short. It's as if the old writing rule that every paragraph should have at least three sentences was taken to mean that you shouldn't have any more than that--the vast majority of the paragraphs have only three sentences and some have less. Between the short paragraphs and the double-spacing throughout, the book feels very choppy. Which is a shame because the mystery itself is very good and a better reading rhythm would have increased the reading the pleasure enormously. The other disappointment is the cover. After going to great lengths to give this novel a very Golden Age atmosphere, that cover is very in-your-face (Look at all that blood!!!) and about as far from a classic mystery cover as you could get. Not that some of the cheap, pulp editions of classic novels couldn't be a bit lurid, but at least the artwork was good and the artists used some imagination. This one looks like someone just dumped a cupful of red paint onto a black piece of paper. Thanks to Kelsey at Book Publicity Services for arranging the delivery of this review copy. 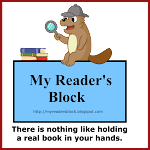 My review policy is posted on my blog, but just to reiterate....The book was offered to me for impartial review and I have received no payment of any kind. All comments in this review are entirely my own honest opinion. A.H. Richardson also enjoys writing murder mysteries and who-dun-its. She is the author of the Hazlitt/Brandon series of murder mystery novels. The series follows a pair of clever, colorful and charismatic sleuths - Sir Victor Hazlitt and Beresford Brandon. 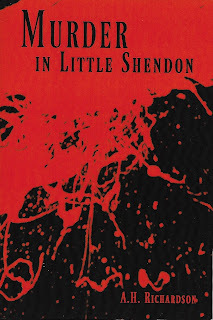 The series includes Murder in Little Shendon, Act One, Scene One – Murder, and Murder at Serenity Farm. 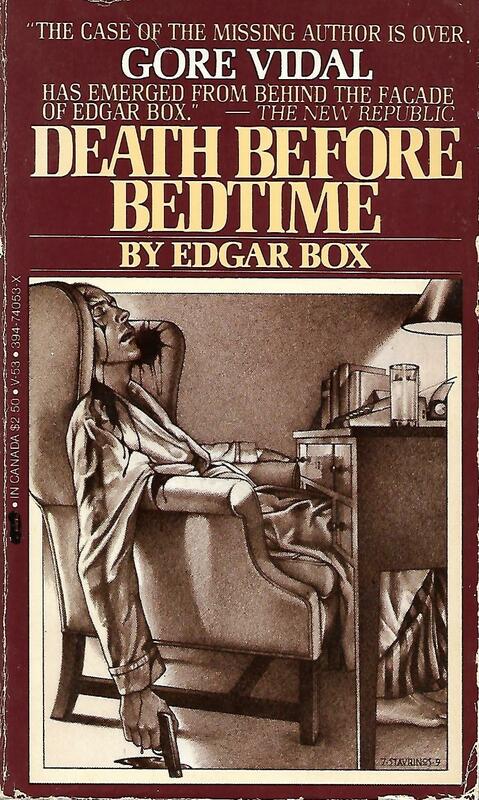 Death Before Bedtime (1953) is the second of three mystery novels written by Gore Vidal under the name of Edgar Box. After his novel The City and the Pillar (1948) which featured descriptions of homosexuality that caused him to be blacklisted by The New York Times, Vidal donned the Box pseudonym and used it to produce the three novels for cold, hard cash. His series stars Peter Cutler Sargeant III, a publicity man turned amateur detective when his business lands him in the middle of three murder cases. 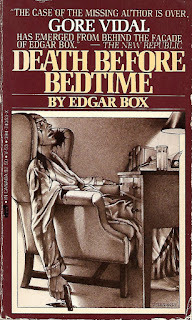 Death Before Bedtime is modeled after the Golden Age penchant for country house murders but has a very political twist. It is set at the lavish Washington DC home of a conservative Midwestern Senator. Senator Leander Rhodes decides to make a bid for the White House and hires Sargeant to handle his publicity--starting with his announcement to run which is planned to occur during his speech before the National Margarine Council. Sargeant meets the Senator for the first time, sits down for dinner with the Senator and a houseful of guests, has a cozy little chat with Rhodes about getting the campaign wagons rolling, toddles off to bed after a nightcap and another cozy chat with one of the ladies staying for the week, and is prevented from going to sleep by a house-shaking explosion. The Senator has been blown up by explosives hidden in his fireplace. As far as the police are concerned, the logical culprit is Roger Pomeroy who is vitally concerned with a brand-new, top-secret explosive. But then the Senator's secretary is found dead from an apparent suicide and papers are found that implicate him in some nefarious doings. Again, the police are all set to wrap the case up and call it a day. But Sargeant is not convinced that it was suicide and decides to do a little sleuthing on his own. He plays detective and starts interviewing all of the members of the household and the guests. But what he discovers doesn't make him particularly happy and he's ready to let the police have their way. Until the murderer decides Sargeant has been just a little bit too nosy and tries to arrange another suicide....now it's personal and Sargeant won't rest till he's able to hand the murderer over to The Lieutenant. Gore Vidal is no Agatha Christie. The plot is adequate. The characters are relatively fine. The setting is okay too. But there's no pizazz. There's nothing special to grab the mystery reader's attention. And honestly, I didn't much care for Sargeant's on-again, off-again approach to amateur sleuthing. He's all about showing up the Lieutenant when he first decides it's murder and the police have it all wrong. Then he decides, Nah, I'm not so into sleuthing after all. I'll let the cops think the wrong guy killed the Senator and then killed himself. Then he's all hot to sleuth again when the murderer tries to knock him off. Not exactly the ideal detective for a county house style mystery. This counts for the "Typewriter" category on the Golden Vintage Scavenger Hunt card. Those Who Hunt the Night (1988) by Barbara Hambly falls under quite a few categories: horror, gothic, paranormal, fantasy...and mystery. At its core, this story which features a large number of vampires is a good old fashioned mystery. Somebody is killing the vampires of the London. Vampires have been in England since Elizabeth the first was queen but now they're being killed by someone who knows the ins and outs of how to safely do away with the undead; someone who can stand the light of day in order to rip open the shutters and boarded-up windows and fling aside the coffin lids that protect the vampires from the killing light; someone who knows to decapitate them and drive stakes through their hearts. And Simon Ysidro, the oldest of the London vampires, knows that he must find someone who can operate in the sunlight to track down the killer. He must do what none of his kind have done before...take a mortal into his confidence. So, Professor James Asher, formerly at Her Majesty's service in the Great Game of spying, comes home one evening to find his wife and servants in a strange coma and Ysidro seated at his desk. Asher has lately spent his time as a researcher in legends and languages and is soon convinced that Ysidro is what he claims. To ensure that Asher will work for him, the vampire also proves that he now holds a power over Mrs. Asher that will reach her no matter where she may go. Asher has felt similar pressures to do work that may not have been to his liking while in the espionage game, but he's always had a bit of leverage that kept him safe after the game was over. What leverage can he find that will keep him safe once he finds the vampire hunter? Why would Ysidro let him go free now that Asher knows vampires really do exist? And, of course, before that consideration, what if the vampire hunter realizes he's on the trail? I'm not particularly a fan of vampire books. I do like the original Dracula and there have been a few short stories featuring vampirism that have been well done, but more recent works (Interview with the Vampire, for instance) have definitely not been my things. The greatest attraction of Those Who Hunt the Night for me was the mystery element. 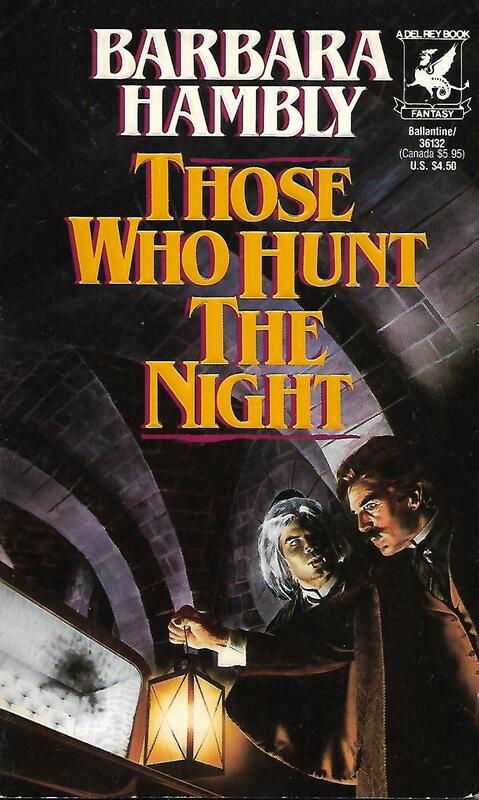 I found it quite intriguing to have the detective of the piece setting out to hunt down the vampire hunter. Hambly did a good job setting the ground work for Asher's motivation to find and stop the vampire killer. And once we were allowed to get to know Ysidro, I began to want Asher to find the killer for the vampires' sakes and not just to prevent harm to Asher's family. Hambly also provides us with vampires that seem very plausible--explaining their powers and their condition more scientifically (in keeping with the late Victorian era's developments in science and medicine). Her characters are well-drawn and interesting and it seems very possible that Ysidro and the other vampires could have been alive for hundreds of years. She also examines the ideas of predation and what toll such an existence might take on a being. Some of the vampires seem to exult in their powers over mortals, but others seem to consider the effects of their actions more thoughtfully--it doesn't, of course, prevent them from preying on mortals as they must needs do; but they do seem to struggle a bit with what they must do. A comparison is made to some of the deeds Asher performed in the name of Queen and Country while a spy. He may have regretted them, but they were a necessary part of his job. This counts for the "Candle/Etc (Lantern)" category on the Silver Vintage Scavenger Hunt card. 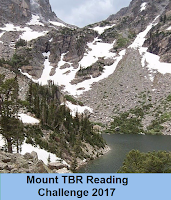 June was another pretty middle-of-the-road kind of month as far as reading went. Lots of average, three-star ratings--with a few dipping into the two-star range. 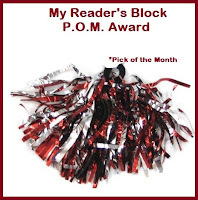 I did have three 4-star winners: J. Jefferson Farjeon with Mystery in White, The Arctic Patrol Mystery by Franklin W. Dickson, and Michael Gilbert with The Killing of Katie Steelstock. The Hardy Boys make a good showing in The Arctic Patrol Mystery with a much more action-packed and dangerous story line than most that I remember reading when I was young. I mean, after all, Chet & Biff are nearly blown up in cave by the bad guys! If it hadn't been for perfect timing on the part of Frank and Joe, their buddies would be history. Overall, a suspenseful and fun read--with some interesting background information on Iceland thrown in for good measure. But not quite enough to grab the coveted award. 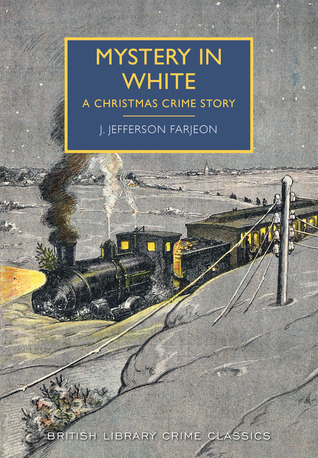 Farjeon loads his mysterious Christmas tale with all sorts of unlikely things--from psychic tremors that tell of past misdeeds in the house to unlikely connections among the cast to the police's ability to swallow the tale that Maltby ultimately spins them (to protect the innocent--you know). But--the tale is such great fun and is such a wild bobsled of a ride through Farjeon's winter wonderland that one can suspend one's disbelief in psychic happenings. And the psychic episodes are brief enough that they don't detract from the mystery. A thoroughly enjoyable romp through the 1930s countryside. 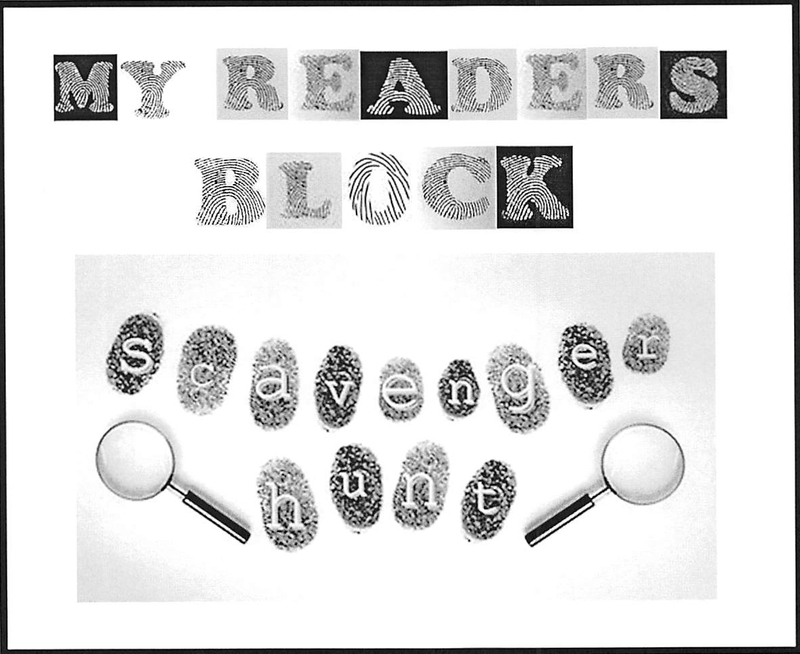 And our second Vintage Scavenger Hunt winner for 2017 is link #11: Joel @ I Should Be Reading who found a knife on Lionel Davidson's The Chelsea Murders. Congratulations, Joel! I will be contacting you soon with the prize list. Thanks to everyone who is out there scavenging in the mystery fields with me. Another set of scavenger items is waiting in the wings for our next check-in post. 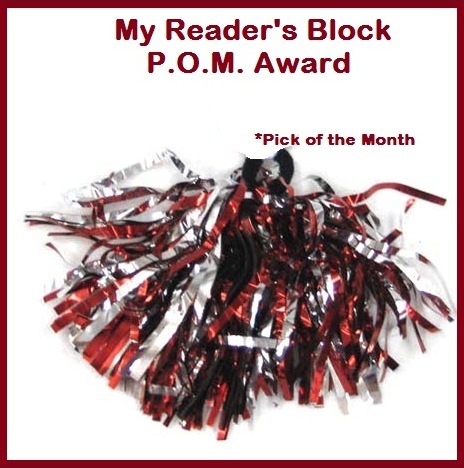 I just got the chance to haul out the random number generator and select our Mount TBR checkpoint winner. Let's feed in all the entries, listen to it clank and whir, and we have a winner! Our lucky climber is Link #6. A quick peek at the Checkpoint Post tells me that our winner is Link #6 Jean at Howling Frog! Congratulations, Jean! I'll be contacting you with the prize list very soon. Thanks again to all of you who checked in...and to all who are busy climbing with us! See you at the next checkpoint! The Killing of Katie Steelstock (1980) is a fine police procedural by Michael Gilbert set in a small town in England. Katie Steelstock is the local girl who made good by becoming a TV sensation. But she still lives mostly at home in West Hannington and comes back to attend the local Tennis & Boat Club dance. Her regular "chauffeur" Tony Windle is unable to provide the expected ride when a prankster puts his car (and a few others) out of commission, so Katie has to provide her own transportation. She makes a good showing at the dance, but leaves earlier than her friends and neighbors expect and they all figure she's gone off to meet a boy. It looks like her romance went sour when the man who serves as caretaker for the club finds her body near the boathouse--a popular spot for those wanting a bit of privacy. The obvious suspect is her on-again, off-again boyfriend Jonathan Limery. Jonathan isn't terribly popular with the local police as it is--he's a hotheaded journalist who likes to incite unrest among the younger set and has no good words for law enforcement. With Katie's ties to influential people in London, Chief Superintendent Knott from Scotland Yard's Murder Squad is on the spot sooner than might be normal in such an investigation. He and his crew find a note that points to Jonathan and when the journalist produces a poor alibi and tops things off with resisting arrest (stabbing a copper in the process), it looks like Knott has found his man in record time. But even as Knott is preparing his evidence for Jonathan's trial, young Sergeant McCourt of the local force continues looking for ties to a completely different suspect. He's quite sure that a local bigwig, Mr. George Mariner, has more to answer for than Jonathan ever could. Two coppers with single-minded efforts. Knott has his eye on a promotion--a promotion that will be his for the taking if he can swiftly and cleanly wrap up this high-profile case. And McCourt has an axe to grind with his favorite suspect--is he deliberately misreading evidence to hang an innocent man? Also up for consideration are a few promising clues from Katie's London life and the appearance of a mystery man in West Hannington on the very night of the murder. Then another body is found...this time floating in the river and the police surgeon notes that the wound is similar to that on Katie's head. The fact that it's a man connected with a sleazy photographer from London with connections to Katie doesn't faze Knott or McCourt a bit. The defending counsel has a few surprises up her sleeve as well and it isn't until they all meet in court that the truth will finally come out. Who really killed Katie Steelstock? Was it Jonathan? Was it McCourt's favorite George Mariner? Was it someone who followed Katie down from London? Or was it someone else? 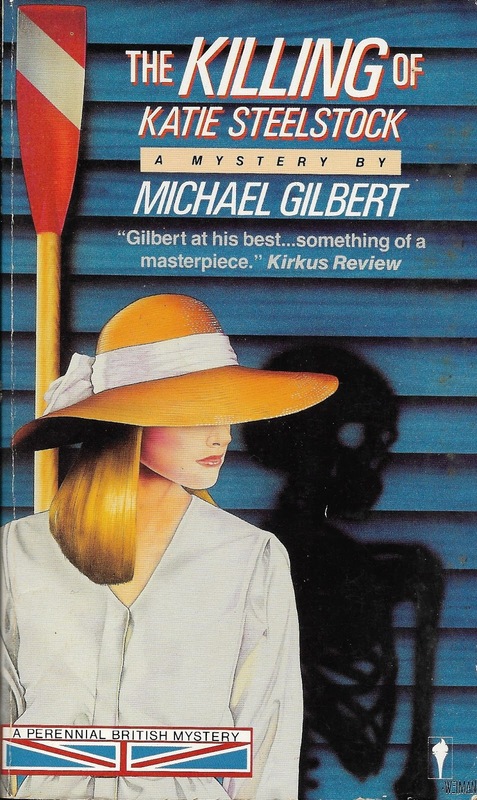 For a more indepth look at Gilbert's novel, please visit John's review from November 2014 over at Pretty Sinister Books. This fulfills the "Hat" category on the Silver Vintage Scavenger Hunt card. The Birth Year Reading Challenge was one of the first--if not the very first reading challenges that I signed up for when I first discovered book blogging back in 2010. I zoomed through a large chunk of the famous books published in my birth year and later rounds allowed us to use birth years of other people in our lives. This time 'round she urged us to return to our own birth year. When I first joined up, I forgot to set a goal. However, my original list had 17 possible books on it. 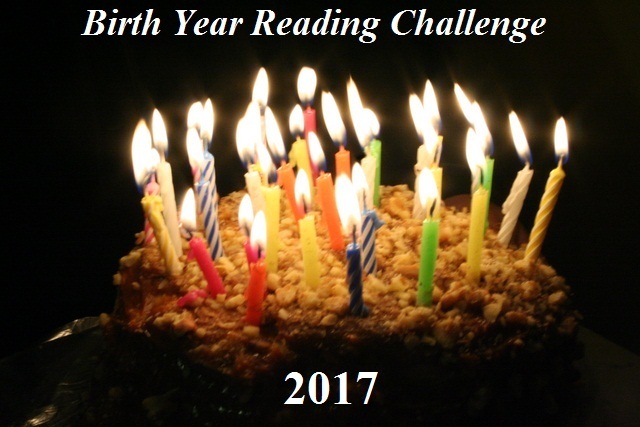 So, I decided that once I got 17 candles lit on my birthday cake, then my challenge commitment would be complete. I may squeeze in a few more 1969 books this year--but I claimed my 17th book with The Hotel Cat by Ester Averill. Thanks to JG at the Hotchpot Cafe for hosting this one again! There were a number of excellent children's books that were published in 1969 (the same year I made my debut in the world). 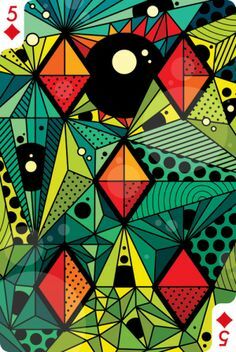 Excellent books that I somehow managed to miss out on when I was growing up--like The Very Hungry Caterpillar by Eric Carle and Sylvester & the Magic Pebble by William Steig. I didn't read either of these until I had my son and we discovered these stories at the library. 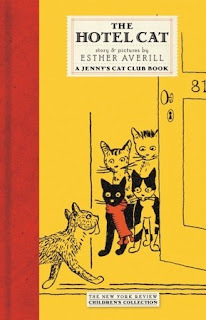 The Hotel Cat by Esther Averill is another children's book that I never heard of until I went searching for more 1969 books for the Birth Year Reading Challenge. 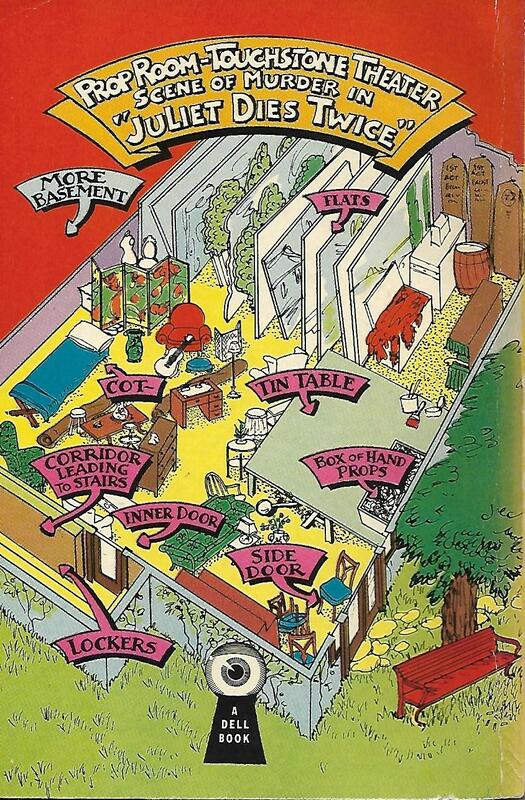 It gives us the story of a stray cat who makes his way to the Royal Hotel cellar. Mr. Fred, the Furnace Man, takes him in, gives him a good meal and, after the young cat proves himself a worker by taking care of the rats and mice in the cellar, offers him a home and a name--Tom. Soon, Tom has the rodent population under control and he ventures upstairs to see if there might be work for him there as well. He meets Mrs. Wilkins, a long-time resident of the hotel who has a gift for talking with cats, and she helps him discover the true work of Hotel Cat--to welcome any guests, including the numerous cats whose owners seek shelter in Big Freeze. Tom isn't sure about sharing his territory with so many other cats, but he learns lessons in friendship as well as being a good host and in the end he finds himself welcomed to the Cat Club and helping to host an unforgettable Stardust Winter Ball.